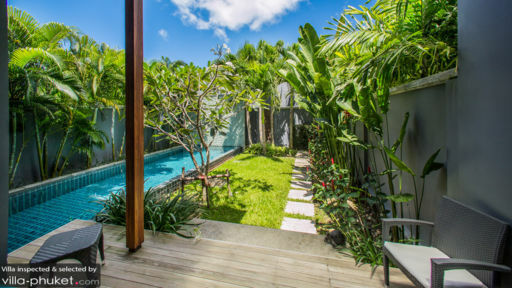 Villa Emere is part of the Onyx private villa compound which is located on the beautiful island of Phuket, just a couple of kilometres away from the popular Nai harn beach. This is the perfect spot for swimming, especially during peak holiday season, and guests can indulge in some watersports right at their doorstep! The cosy and inviting private villa is home to two spacious bedrooms and quality living/ dining situation. 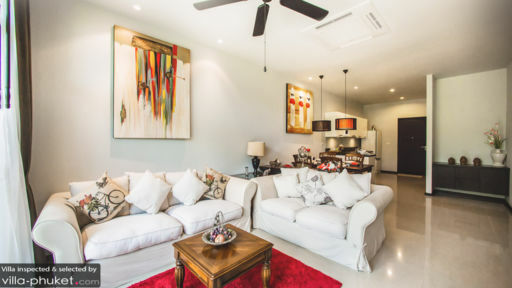 Villa Emere is the right place for short and quick stops in Phuket as you get to make the best of the island, while enjoying a comfortable and exclusive stay. The two large bedrooms at Villa Emere are well-furnished with king-sized beds and the master bedroom is, in fact, furnished with a canopied king-sized bed. It opens out right to the swimming pool, making for a perfect diving spot! There is a private bathroom for the guests, which is again fitted with modern amenities, like a showering area and a large soaking tub! Each room is decorated with a similar exotic and contemporary vibe, making them seem inviting for the guests, so you can feel right at home! A sea of green and blue is what awaits you as you take in the beautiful outdoor space at Villa Emere. 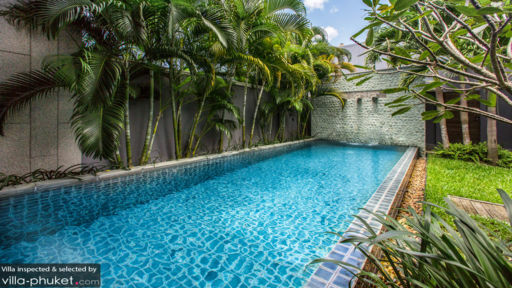 It is a smaller and comfier villa, wherein you will find a large swimming pool bordered by abundant tropical foliage, on both sides, and a verdant garden which is well-manicured for you to relax on. Breathe in the fresh air and feel right at ease amidst the walled gardens, as they will provide solace from otherwise busy lives. On the pool deck, you will find rattan chairs and tables, where you can lounge and have your morning tea before stepping out to explore the rest of the island. The living area at Villa Emere opens directly to the pool deck through glass doors, offering you great and easy connectivity throughout the villa. The living area is a fusion of contemporary and traditional, with traditional décor and a contemporary aura in the air. The room is well-furnished with plush, comfy couches placed facing a large flat-screen TV, where you relax and spend some quality time with your loved ones. There is a dining and kitchen area as well, right after the sitting area, which is furnished with a wooden dining table, fit for four people, and designer overhead lights adding to the opulent area. Also accessible is the large and spacious modern kitchen, which is fully-equipped with all the necessary amenities and appliances, which you can utilise while you showcase you brilliant culinary skills! There is a dedicated staff at the villa to cater to your needs without hesitation, and who will ensure that there is daily housekeeping and maintenance. Villa Emere is close to Nai harn Beach, which is a mere 1.8 kilometres away from the property, where you can go swimming, sailing, or diving! There are quite a few restaurants in the vicinity, where you can try out local and international cuisines as well!